In the days immediately following this year's Scottish Canoe Symposium the OCA has arranged to for Ken Hughes to deliver a 3 day pilot programme for what we hope will become one of the most sought after "trad" courses in the UK. Ken Hughes is a BCU Level 5 Coach, Coach Educator, White Water Safety/Rescue Course provider, and National Trainer in a range of disciplines. He is also an active Mountain Instructor (MIA) and an ITC First Aid Trainer and has been coaching for two and a half decades in Kayak, Traditional Canoe and Specialist White Water Canoe (C1/OC1) and has worked in the outdoor education industry for 26 years. He wrote the chapter on OC1. This is not a BCU Course; however a certificate will be issued at the end of the course to confirm you have completed the training. The BCU do not yet have an AWWSR for Canoes. This is not stopping us recognising that there are those of you who paddle on grade 3 in canoes who would like to get some great training in the paddling, safety and rescue techniques essential for advanced conditions! So if you would like to up your game for the grade 3 environment, we can help. Cost - substantially discounted for OCA Members - click here for details. All paddlers are encouraged to consider this excellent course if they paddle canoes on advanced white water, or have completed the WWSR Course and would like an extension to that training. The course takes place on grade 3 water. Candidates should be confident in their ability to paddle on that grade, although portage options will always be available. In addition the course requires some swimming; course participants should be confident swimmers. 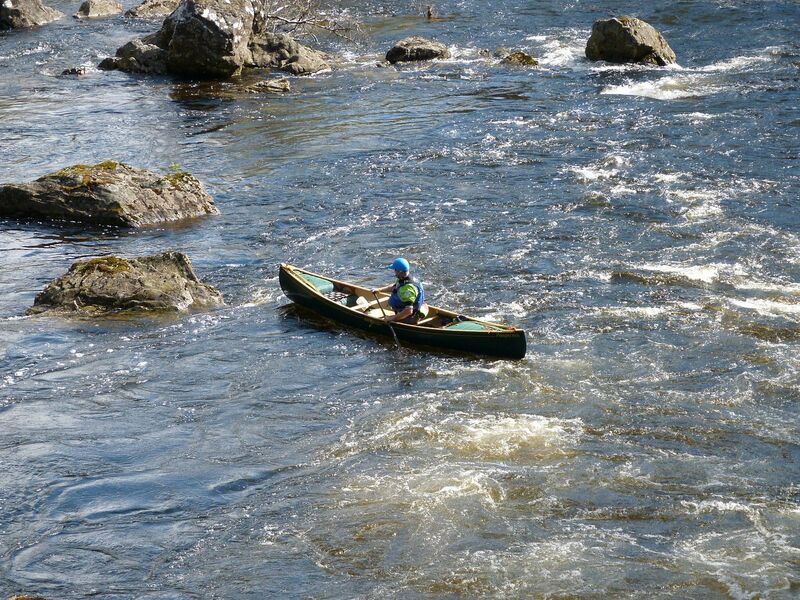 Paddling strategies for Grade 3 Rivers and complex rapids. Using the boat as a rescue platform. V-Hoists, tracking and rafts. There is much less need to be in the water on a line when paddling Canoes. A broached boat is hard to remove at the best of times. We include a range of technical ropework, but put the emphasis on being clever with its application rather than just applying force. Stabilising and extricating an entrapped paddler. Preacher-pins, trapped legs and boats folding are all hazards. We look at the essential kit, techniques and outfitting your canoe to deal with these. Skilful use of the self-rescue/swim-line. Get slick and quick and make self-rescue look cool! Moving boats around on difficult terrain, in gorges and safely managing the group on steep river banks. Safe Paddling Strategies. Options for negotiating complex rapids safely and preventing the problem in the first place. The canoe offers options other craft do not; we will maximise these and send you away with a range of useful possibilities. Like the AWWSR, we would normally expect you to have completed the standard BCU WWSR, but you are free to chat it through to ascertain how suitable this course is for you and we welcome questions. A Traditional Canoe outfitted for white water use, Paddle, bailer, pole, swim-line/s, etc. Clothing for paddling and swimming. Slings, HMS karabiners, Prussic loops, pulleys, throw-lines, knife, whistle and bush-saw. Food and drink. A fairly large flask to have a hot drink handy. If you are unsure about any of the equipment contact us before the course we may be able to lend you what you do not have.